Winnie The Pooh has always been children's favorite character. Honest, naive and honey-loving bear does not need any introductions as every kid loves playing with him and being his friend. But what what happens when kids grow up and become adults? What happens with their old childhood friends? This year's Disney release Christopher Robin brings our favorite stuffed animals to life and even more to the real world. The movie follows Robin who is a grown-up, married and has a daughter. After spending long time on battle fields during World War II he returns home to re-connect with his family. Robin tries to do his best and gets a highly-stressful job as a manager working long hours to meet expectations of his team and his bosses. His daughter Madeline misses his terribly when he is at work and just want her dad spent more time, particularity summer time with her. One day Christopher Robin tired after his job sits to relax on the bench in the park and accidentally encounters Winnie The Pooh, who turns out to be lost and looking for his friends. Robin goes back to The Hundreds Acre Woods to get Pooh back to his friends and convince them that he is not a Heffalump but their old friend Christopher Robin just grown-up. I think Eeyore was amazingly funny. The main problem is that Robin cannot stay with them, even if he wants he is grown up now. Grown up Christopher Robin has responsibilities, job, family, a little daughter and he is lost at the same time. So he returns back to work from his summer home, leaving Madeline upset he cannot spend time with her. But eventually she stumbles upon her dad's toys when she goes to play outdoor only to find out that Robin left important work paper with his stuffed animals. Madeline really wants to help The Pooh and his friends to get to her dad, because these stuffed animals are the only ones who thinks that her dad is a wonderful person and he is truly cares about her. In the world when she almost lost a hope to get her dad and be close with him, Madeline takes on a dangerous trip to find her dad, riding alone with stuffed animals, who are actually amazing creatures! Throughout the journey the ones who lost finally found what they are looking for. I think it was not only Robin and Pooh who were lost, I think Madeline and her mom are the ones who want to find their perfect dad and a husband. Such a wonderful story how childhood memories, favorite toys and a little bit of magic can change the whole world. The movie has lots of funny moments, Eeyore has lots to offer with his particular pessimistic attitude and remarks. You should also watch how people react to when they see talking, commenting and walking stuffed animals, and an encounter with the guy from Paddington movie. Disney’s Christopher Robin, the wondrous, live-action film in which Winnie the Pooh and friends venture into mid-century London to help grown-up Christopher Robin, arrives instantly on Digital and available on Blu-ray™ and DVD with captivating, behind-the-scenes extras. Now enter to win a copy of Disney’s Christopher Robin Blu-ray™ and DVD below thanks to Walt Disney Studios Canada! The giveaway is open to Canadian residents & ends November 22, 2018. I like to watch it with my granddaughter. I would love to watch this movie with my granddaughter and my daughter! I'd love to watch this with my grandkids! I would towatch with the whole family and the grandkids! I would love to watch it with my granddaughter who loves Winnie The Pooh. I would love to watch this with my family on one of our movies nights. While I know my daughter will enjoy this, my son has always loved Winnie the Pooh so I now he would love this movie. I would love to watch this movie with my nieces. I'd like to watch it with my son and daughter! my granddaughter would absolutely LOVE THIS! my son and I would love to watch this together. I like to watch it with my grandkids. I would love to watch this movie with my husband and our kids. 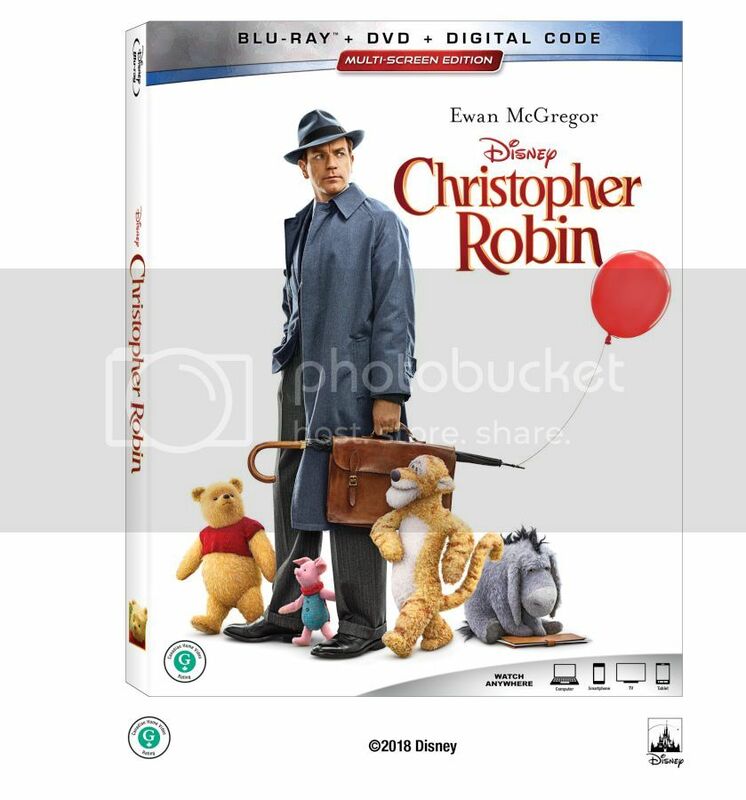 Disney’s Christopher Robin Movie Blu-ray/DVD. this Christopher Robin release with? I would watch this with my nieces and nephews. I would like to watch with my grandchildren. I would love to watch this film with my boys. I would love to watch this wonderful movie with my family. This movie looks like a nice holiday movie. Oops......I didn't see the Canadians only until after I entered. Sorry about that. I would love to watch this with my niece. Just realized this is for Canada and I'm in US. Please disregard my entries. I would love to watch this with my little grandson. If I were lucky enough to win I would watch this with my daughters! I will watch this with my 4 granddaughters. This would be fun family viewing for the holidays. I would like to watch this movie with my cousins. My grandchildren would absolutely like to see the cool Disney’s Christopher Robin, always. I have grandchildren that would definitely like to watch the amazing Disney’s Christopher Robin all of the time. My nieces and nephews would really enjoy viewing the marvelous and great Disney’s Christopher Robin for a great time. A wonderful Disney’s Christopher Robin, my grandchildren would like to always watch for lots of fun. I have nieces and nepbews that would enjoy seeing a fabulous Disney’s Christopher Robin many times. My many children would just love to view the awesome Disney’s Christopher Robin for a fun time.